One afternoon at Rushden Lakes and I was set for a cheeky weekend away! 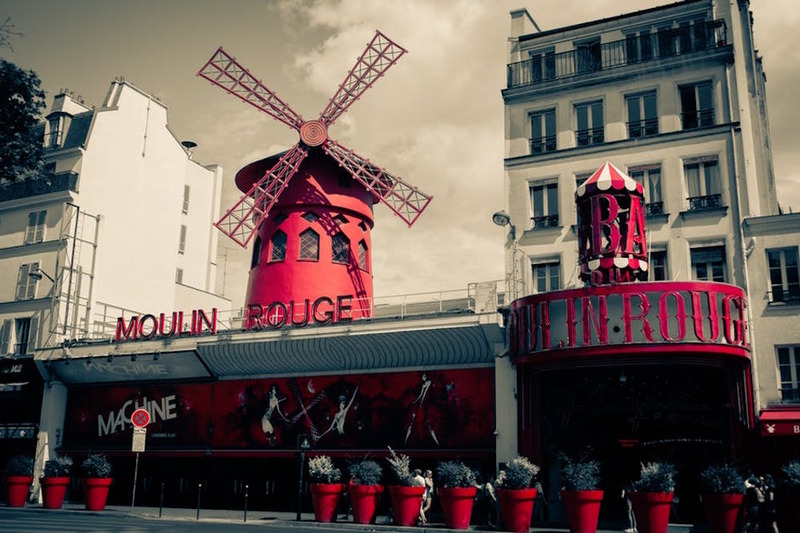 Ahhhh Paris in Spring. 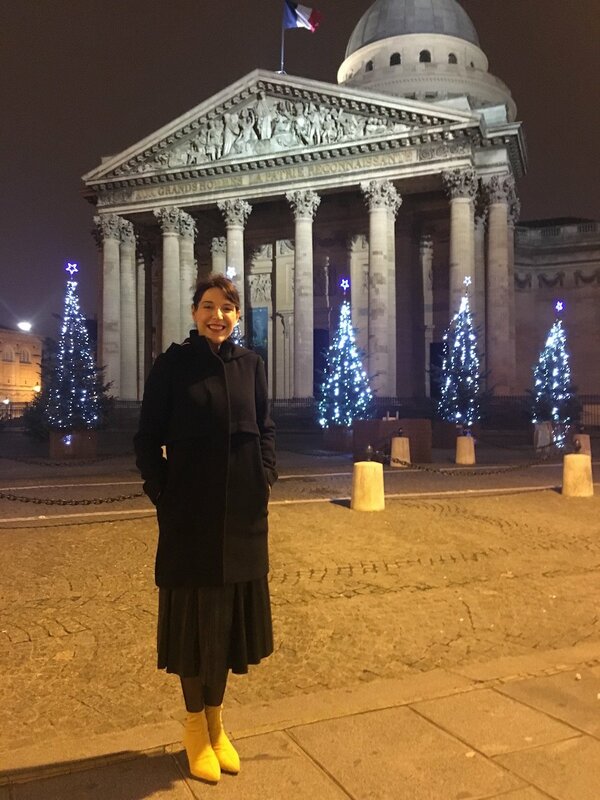 Or even January… but whatever time of the year, one can’t do Paris without a French inspired capsule wardrobe. Step forward Northamptonshires newest and most popular retail hub, Rushden Lakes, which was the start point for my epic birthday adventure to Gay Paree, city of culture, city of art, city of love. Actually the love affair started 48 hours before I even stepped onto Eurostar, as I pulled up in the retail sensation that is Rushden Lakes. With Christmas traffic jams now a distant memory, I parked easily and even better I had my birthday money and Christmas gift cards with me (they were burning a hole in my pocket). So off I went – Heigh Ho. I was looking for key pieces for a loooooong weekend in Paris. 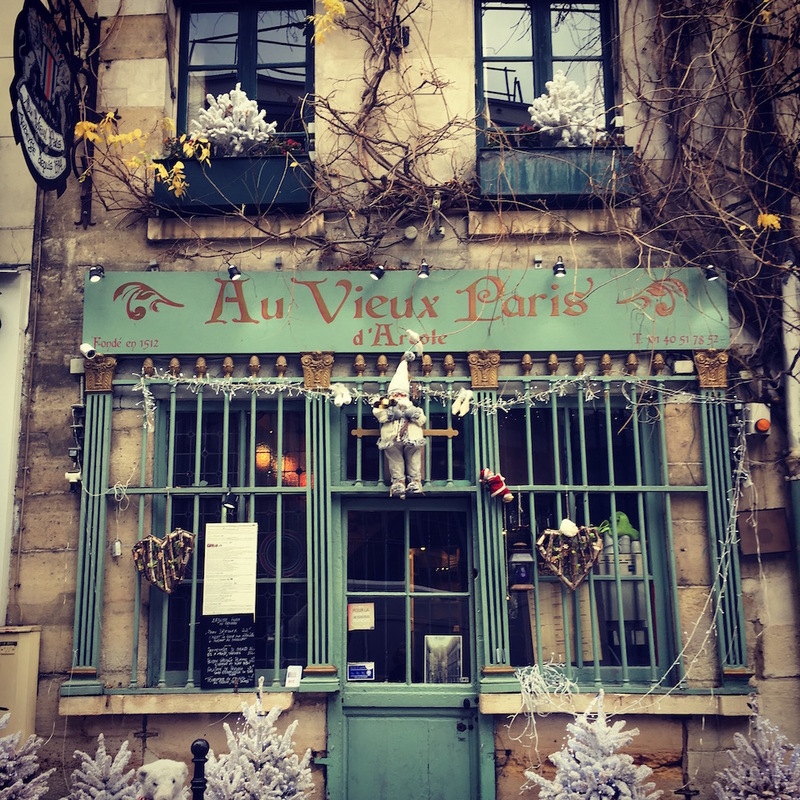 A chilly Paris at that – although once inside the bars and nightlife it was going to be ‘chaud, chaud, chaud’ – so I was looking for comfortable yet stylish bits and bobs that I could wear as sophisticated (?) 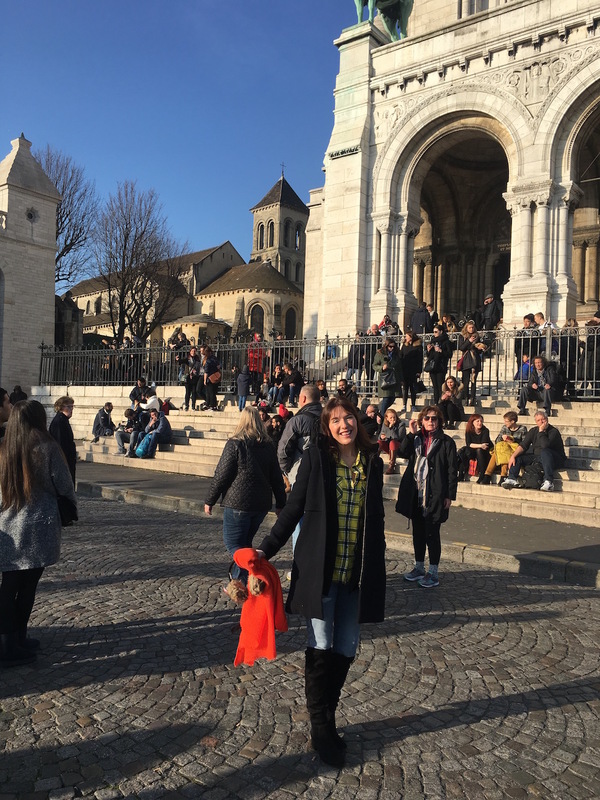 Parisian evening crashed into freezing cold, sightseeing tourist daytime. First stop of course was lunch (a girl needs energy), and a step into Eden, their lovely bistro restaurant and wine bar! Well I had to line my stomach – there was serious shopping ahead of me after all. As a journalist and blogger, this Muddy found Eden to be a perfect place to consume 2 of my 5 a day. I like strawberries and fizzy grapes. Great combo. There’s a lemon on that fish goujon. Make that 3 of my 5. Do sweet potatoes count? All joking apart, the food and atmosphere in Eden is lovely. 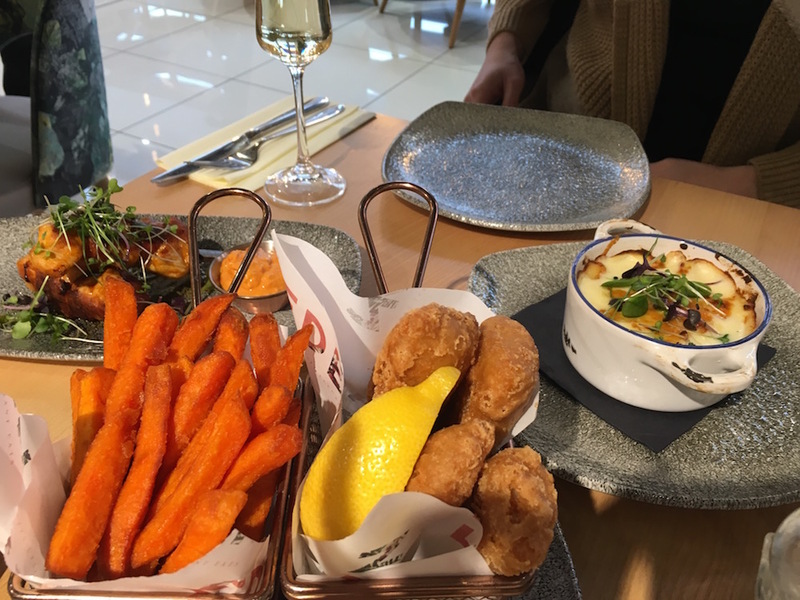 It’s located on the second floor of House of Fraser and as the name suggests, it really is a little slice of heaven, with a varied menu, tasty food and brilliant service from a really keen bunch of friendly staff. It’s not a massive menu, but it’s ample enough. Fed and watered I ventured toward the shops with a Prosecco spring in my step. 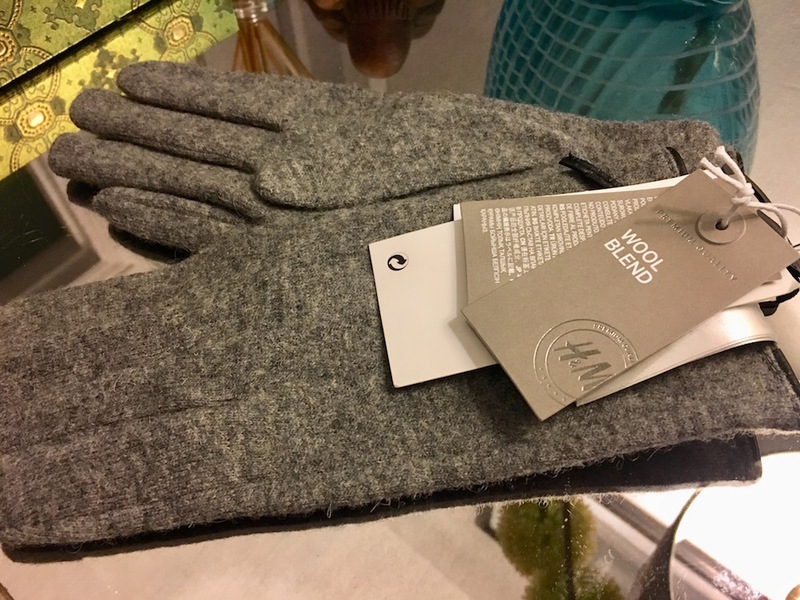 Next stop was H&M, which always offers great value for money and so some wool blend gloves, where the first purchase (ahem). Then a blue dress. Oh and a yellow check shirt (further below). I was so surprised at the quality of the items on offer I went slightly over my £50 gift card budget – but still got change from £100 (the kids can eat packed lunch for a few weeks, and I’ll pop one of my new jumpers on whilst we turn the gas central heating off until next Winter). A pre Paris dress up. Ooh la la. As it turned out, the gloves were life savers. Warm in Paris, but also much needed as the wind rushed off Stanwick lakes onto we, unsuspecting shoppers. Lovely. Simple. Stylish – and yours for under £10. So with gloves immediately put to use, I hopped over to Hobbs, as their Sale screamed at me and bargain of bargains I found a coat that I love. Hobbs definitely combine quality items with great deals. 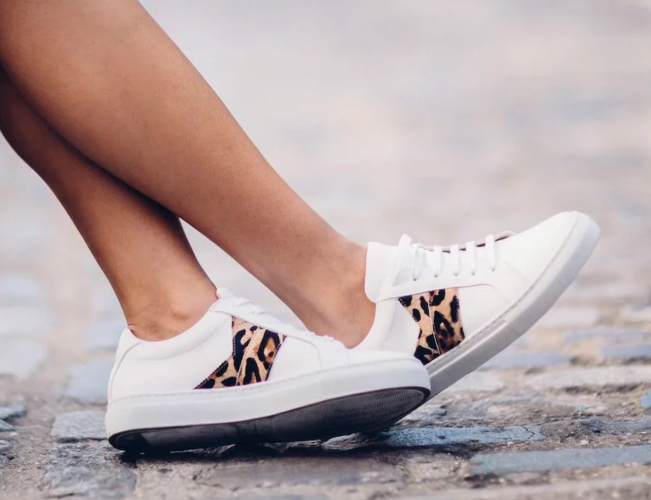 Some of their leather is beautiful and deserving of an upmarket price tag. However, I found my dream coat in their brilliant sale. So I was in possession of all the Hobbs quality but at a smidge less than the original £239 price tag, a veritable snip at £66 and it’s classic style makes it a keeper for many years (I tell myself)… So I was now the excited and proud owner of a Kelsey duffel which I could dress up or down in Paris or anywhere. Did I mention my coat? Here it is in gay (but temperature challenged) Paris. 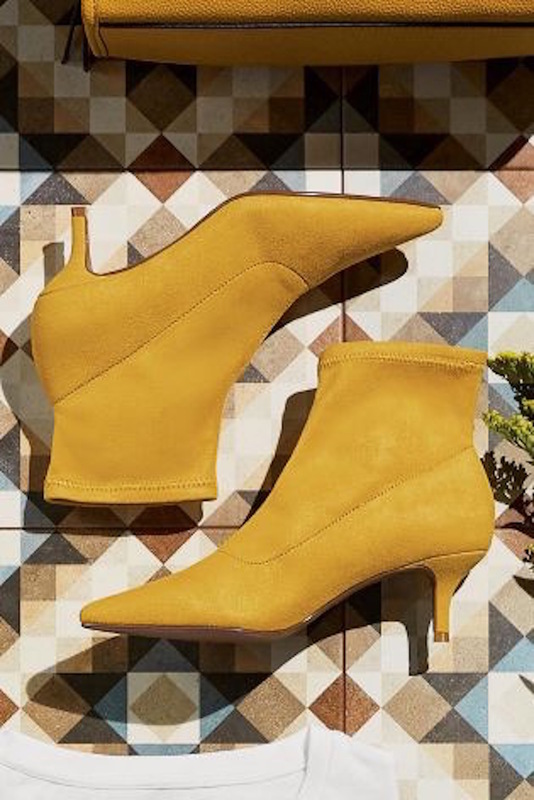 These lovely ochre sock boots from Next added a bit of glam to otherwise dark wintry outfits, and with a small kitten heel were even manageable for a night on the tiles (a snip at £38). 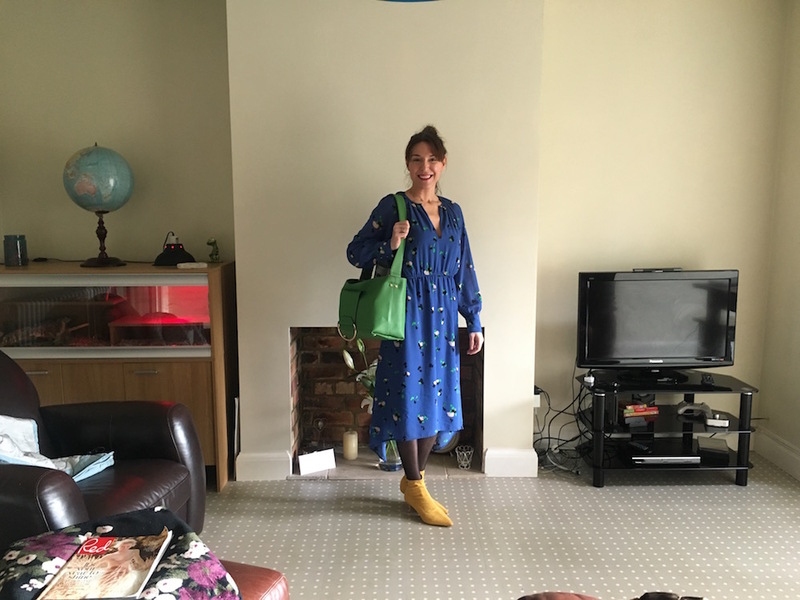 I think it was this giddy discovery that made me courageous enough to explore the Next store further and bag myself a yellow rib sweater (£30) that matched exactly my boots. 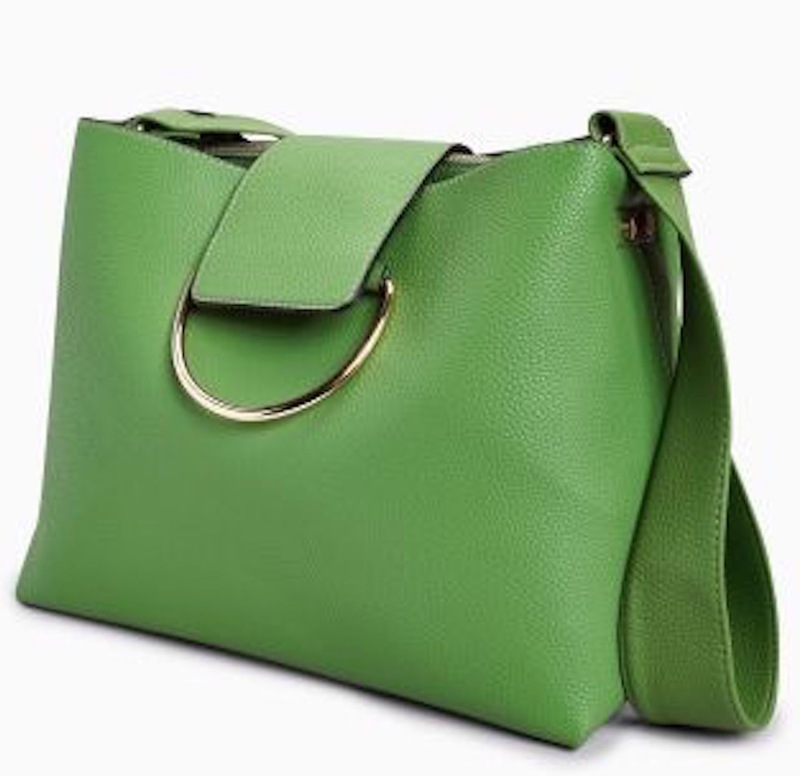 “Well” I thought, “How will my travelling companion distinguish me from other stylish Parisian’s unless I buy this amazing green shoulder bag”. I resolved this conundrum quickly and bought the bag. Perfect for Passports, Paris and Me (£32). Next regularly come up trumps with their accessories. They’re unafraid to be bold, nearly always have their finger on the colour palette pulse. A good job in this case. How else do you mute a bright yellow jumper than with a bright green bag. And it’s practical too. Oh lets have a closer look at those boots shall we? 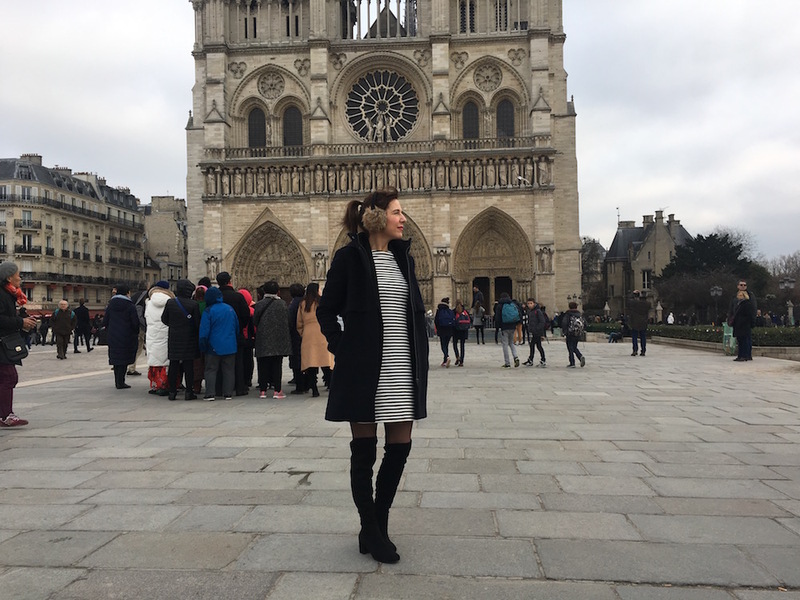 One item I have always struggled with is over the knee boots that you can walk more than a few hundred yards in. Lowish heel please and a good fit at the top required. H&M had the perfect answer with these beauties for a reasonable £40. Shopping each store at Rushden Lakes, I find it really easy to while the hours. Sadly I also find it easy to while away my budget – but hey, it’s Paris and the wide variety of shops at Rushden Lakes means that any budget can be catered for. I was going to leave a happy girl. So with the budget starting to creak and the ‘Eden effect’ starting to diminish I headed to River Island for my annual jeans purchase. I’m not a branded jeans kind of gal so don’t feel the need to go for the usual designer suspects. I buy jeans when I think I need them but I still want quality, preferring to splash the cash on a vin rouge in Montmatre than on a jeans label that no-one will see unless I pull my top up. River Island Jeans offer a good middle ground – on trend denim for all sizes, and at £42 a decent investment that will give you plenty of wear. 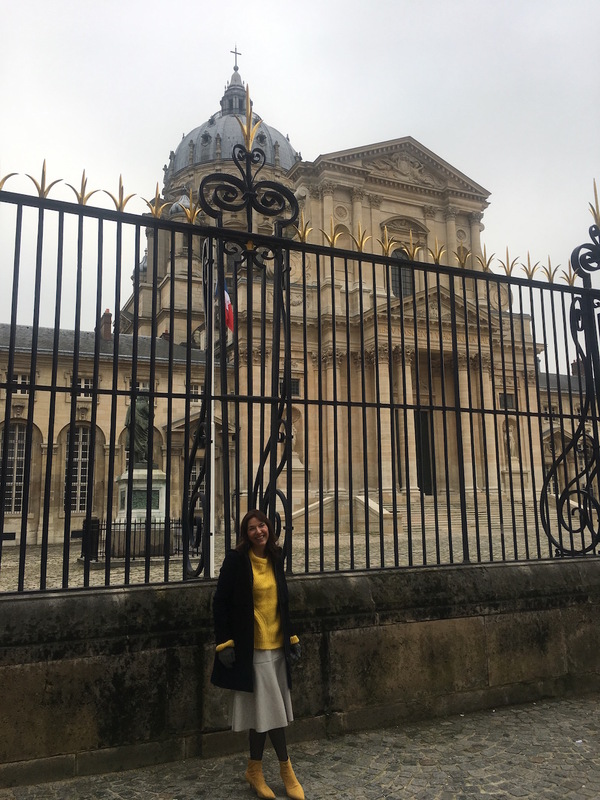 As my sojourn to Paris was to be for 5 days, and I had already determined that yellow was the colour, I headed over to the always busy, always great value Primark. These clothes may not always last the season, but I found a yellow checked shirt that I loved for only a tenner and it set my jeans and coat off beautifully (I thought). Oh, and also my bag. As we traversed the streets of Paris (only 48 hours after the Rushden Lakes experience) I felt great. 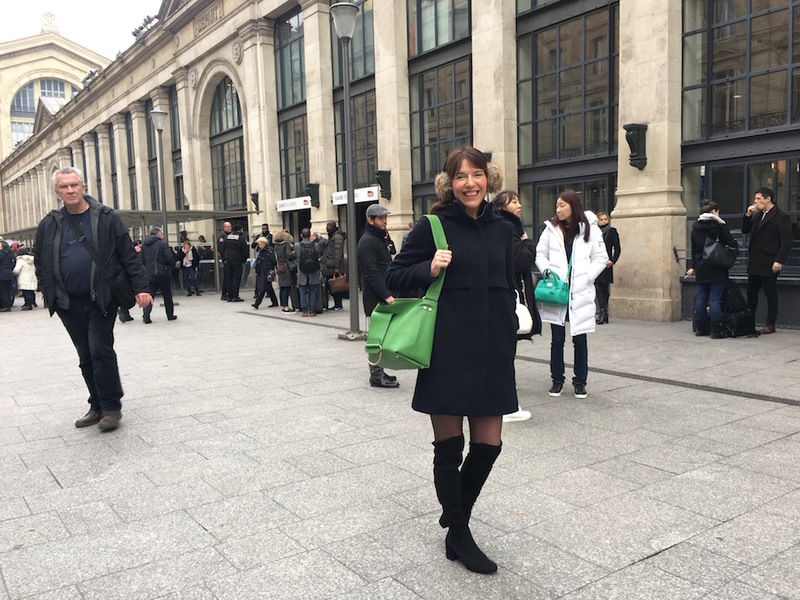 I mixed and matched everything that I’d bought, had a rather successful capsule wardrobe, I was warm, I felt stylish and confident and still had a few Euro’s in my pocket. So with shopping bags galore, and yet another brilliant trip to Rushden Lakes completed I rushed home, to pack and repack my case, ready for an overnight stop over in London and then stepping onto the first Eurostar for Paris the following morning. I love travelling on Eurostar. Its only 45 mins from Welly to the home of Eurostar, St Pancras International, and the same time distance from other Northants destinations into Euston (a 10 min walk to St P). 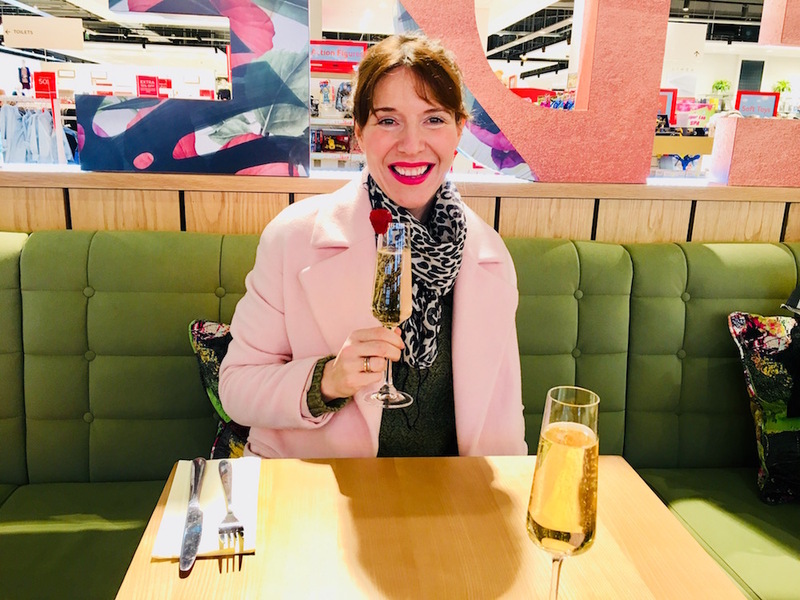 This time, I was a bit early for Searcy’s champagne breakfast, but next time I’ll be in charge of booking the train – and without a doubt I’ll also be heading to the fab Rushden Lakes for my 2018/19 wardrobe refresh. 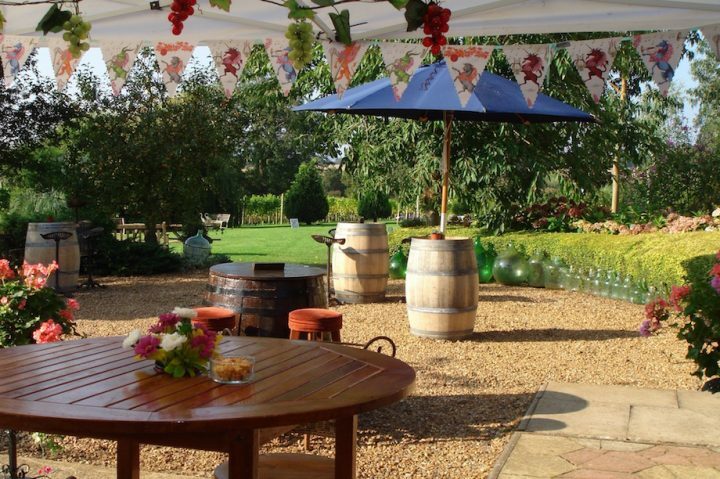 If like me, you need a quick livener in a convivial establishment such as Eden prior to a bit of retail therapy, why not enter the Muddy Northants Facebook? One lucky reader can win lunch for 2 people (up to £50) at a restaurant of your choice plus £100 of vouchers, both for use across Rushden Lakes, just in time for Valentines Day. All you have to do is share the post and like the Muddy Stilettos page (the actual page, not just the post), if you already like the page, leave a comment on why you’d love to win this prize! Closing date for entries is Feb 6. Why would I like to win? 🤔 Well after giving birth three months early, spending 10 weeks going into hospital to visit my beautiful daughter till I could bring her home and now a broken down car…I think I’m need of some good Karma. Also I just love Rushden lakes so any excuse to go back helps! Great read and I absolutely love your new Green bag!! A quick question, is the metal detail gold or silver? Much as I miss mooching round House of Fraser since they left the town centre, I still haven’t managed to visit Rushden Lakes – but this article has encouraged me to make the effort. And the chance of winning the competition is even more incentive. Fingers crossed! Would love to treat my little boy (and me) to a new holiday wardrobe too! My birthday February 15th so Valentine’s day usually gets forgotten by my husband so it would be nice to have a treat of a meal and some retail thearapy. 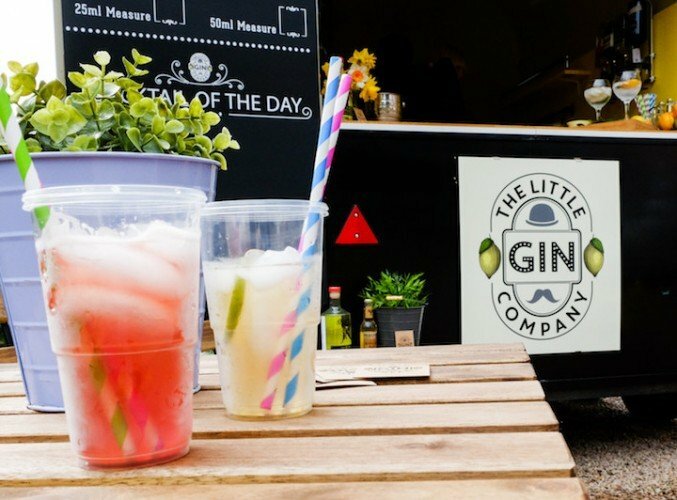 I’ve been looking for an excuse to visit Rushden Lakes – and you’ve given me plenty!